Robin Burcell has worked as a cop, hostage negotiator, and as an FBI-trained, forensic artist . She’s also a New York Times & USA Today bestselling author of award-winning thrillers. Now she uses that unparalleled experience to continue Carolyn Weston’s groundbreaking series of books, which were the basis for the hit TV show The Streets of San Francisco. Sgt. Al Krug and his younger, college-educated partner Casey Kellog are investigating a string of strangulation killings when another victim is found at the Presidio…but a surprising, violent incident at the crime scene makes them wonder if everything is what it seems. The two miss-matched cops, with sharply conflicting approaches to detective work, are under intense pressure to get results. It’s a race-against-the-clock investigation that propels them into the deadly intersection of politics, real estate, media and vice… the fertile, fog-shrouded killing field of a ruthless murderer. With her three decades of law enforcement experience, Robin Burcell has breathed new life into the police procedural. Her clear love and understanding of Carolyn Weston’s original characters and their dynamics make this return to ‘the streets of San Francisco’ a complex, compelling, and ultimately satisfying tale. Great work by a great writer. Paul Bishop, LAPD detective and author of "Lie Catchers"
Robin Burcell breathes new life into the Streets of San Francisco in a riveting, edge of your seat thriller. Robin Burcell, both a writing and law enforcement veteran, takes hold of novelist Carolyn Weston’s baton to create a twisty mystery worthy of the iconic team’s homicide investigation. The streets of San Francisco come alive in this new installment, and I hope that there are more to come. A definite winner! Naomi Hirahara, Edgar Award winner Naomi Hirahara, Edgar Award winning author of "Murder on Bamboo Lane"
THE LAST GOOD PLACE is a fabulous reboot of a beloved classic. With smart, clever writing and an elegant plot, Robin Burcell has nailed it. All hail the reincarnation of Krug and Kellog. 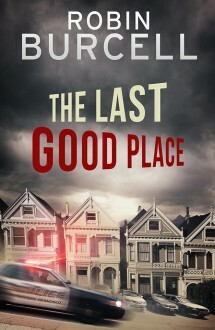 A whip-smart, fast-paced tale with more twists and turns than a San Francisco street, The Last Good Place is a terrific read. Robin Burcell is a true pro! Burcell has always brought a cop’s sensibilities and knowledge to her fiction, as well as a talent for suspense-building. And it’s no less true in The Last Good Place, a craftily constructed procedural that bears the tone of Weston’s fiction without slavishly imitating it. This is a fun, well-plotted police procedural that delves into the inner workings of a police department and its detectives. Readers may be reminded of the writings of Ed McBain, the master of building relationships between officers, utilizing black-humor banter, and keeping his novels timeless. Burcell’s own experience as a police officer, not to mention her own numerous suspense and mystery novels, make her the perfect candidate to continue this series. Burcell brilliantly revisits Weston's cop duo and delivers a modern, dark, twisting tale of murder and deception with a puzzle that will keep you guessing until the end. Robin Burcell has expertly updated the Krug & Kellogg series for old and new readers alike. She knows her stuff and puts it to good use in this entertaining and authentic police procedural. Alafair Burke- NYT Bestselling Author of ALL DAY AND A NIGHT. Talk about a blast from the past...fans of The Streets of San Francisco will love The Last Good Place...Burcell, a former cop herself, treats us to snappy squad-room dialogue but also takes time to highlight the complications of each detective's personal life.